Palace of Tears, or Tränenpalast in German, is a building at Berlin's Friedrichstrasse station that was a border crossing point during the time when the city was split between East and West. It was used by people crossing into West Berlin, so those transiting through here were mostly people who lived in West Berlin who were returning home after visiting family in East Berlin. Due to the painful good-byes that took place here, it was dubbed the Palace of Tears. It was built in 1962 and operated until the Berlin Wall came down in 1989. 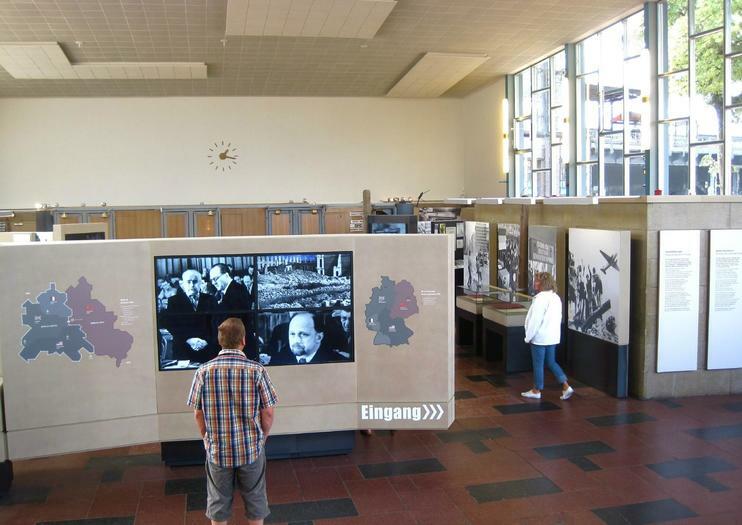 Today it serves as a museum with a permanent exhibition detailing the border experience and every day life in the divided Germany. Visitors can view original materials, photographs, films, documents, and interviews with witnesses, all of which document the effects and consequences of the border on the lives of Germans during this time. The exhibition also displays information on the key turning points of the reunification process. Palace of Tears is located at Reichstagufer 17. Take the U6, S1, S2, S5, S7, S25, or S75 to the Friedrichstrasse station. The museum is on the north side of the station. Opening hours are Tuesday to Friday 9am to 7pm, Saturday to Sunday 10am to 6pm, and closed on Mondays. Entrance is free. Discover Berlin as the frontier of the Cold War on this guided, 4-hour historical walking tour. After World War II, Berlin changed from the capital city of Nazi Germany into the pivotal city in a struggle to control war-torn Europe. Retrace the trail of the “death strip” and the Berlin Wall. Visit some of Berlin’s most popular Cold War attractions, like the Berlin Wall Memorial, Brandenburg Gate, underground "ghost stations," and more. Learn about the history of Berlin, from its founding to this divided city of the Cold War. Explore the German capital on two wheels on this 3-hour small-group Berlin Segway tour. Hop onto your Segway and — following a practise session — spin through Berlin’s bustling streets with a guide. Choose from three different routes, and take in top city attractions such as Brandenburg Gate, Checkpoint Charlie, the Reichstag Building and the Soviet War Memorial. Gain insight into Berlin’s World War II history, stop off along the way for a refreshing drink and soak up the atmosphere in famous squares like Potsdamer Platz. Learn about East Berlin’s history and experience the city’s modern-day activity and culture during this half-day, guided walking tour that is private and customizable. Follow your guide through the time from the Cold War to WWII to the fall of the Berlin Wall, and onward to the contemporary street culture of today’s Berlin. Get to know Berlin beyond the main tourist attractions on this walking tour of the city’s interesting off-the-beaten-path sites. With a knowledgeable guide, gain insight into Berlin’s history and present-day culture as you check out locations like Humboldt University, the Jewish Quarter and Museum Island. Explore back streets to see old tenements, and end at the Berlin Wall for a peek at a hidden spot. Limited to 12 people, this tour provides a small-group experience. Immerse yourself in the Cold War history of Berlin during this private, customizable, 3-hour walking excursion. Learn from a passionate local historian about this once-divided city as you explore landmarks such as Bernauer Strasse, the former East German ‘Tränenpalast,’ and Hauptbahnof (Berlin’s central station). Get an up close and personal view of the Berlin Wall with this informative and entertaining 4-hour guided bicycle tour along the Wall route. Ride through the Brandenburg Gate, closed for 28 years, along the Berlin Wall Memorial and to the Palace of Tears. Hear the history of the Wall along the way and learn the stories of people who tried to escape to West Berlin. Discover the history of Berlin through the eyes of a local, on this private walking tour. Your guide will show you both well-known, big-name sights as well as lesser-known places that you may miss without local help. You’ll hear stories about Berlin’s eventful past, which will help you better understand its present. An informative and fun trip for active travelers who like to learn new things when they travel. We offer you the unique opportunity in Berlin to get on and off as often as you like on our ships. Discover Berlin from a completely different perspective! Whether on a first voyage of discovery or as an old hand, you will get to know the capital in a completely new way on a large stand tour aboard one of our numerous Hop On - Hop Off boats. Delve deep into Germany’s rich history on this 2-hour Berlin Wall and Cold War walking tour in Berlin. Follow a guide from the Palace of Tears (Tränenpalast) along the line where the infamous Berlin Wall once stood. Along the way, discover bridges leading nowhere and ghost stations fallen into disuse. Explore the new government district straddling the border between Eastern Germany and West Berlin, and admire famous landmarks including the Brandenburg Gate. Then, visit Potsdamer Platz and touch the small section of the Berlin Wall still standing. The Berlin Wall, Kruschev & Kennedy, the Airlift, spies, escapes and “the end of history” – it’s fair to say that Berlin defined the Cold War. This tour is a deep dive into a divided city – a time when it felt like World War Three was just around the corner, when one side of the city lived under Soviet-style communism, and the other was occupied by not one, not two, but three Western powers!In air-conditioned comfort, in your luxury German car, you'll be taken from West to East across the German capital, criss-crossing where the Berlin Wall once stood, to get the closest possible look at what life was like back when Berlin was the centre of the Cold War. From famous sights like the Brandenburg Gate and Checkpoint Charlie, to lesser-known memorials and stories that you would never find on your own, this tour is far and away the best way to get to know Cold War Berlin. MEMORIES FOR LIFEStromma produces experiences that aim to give every single guest lifelong memories. These experiences are focused on sightseeing tours, entertainment, and activities for tourists, local residents and companies, where heritage modern and environmentally friendly vehicles, and friendly atmosphere constitute the key components. Our goal is to offer a Worldclass Experience to our customers. For this reason, we decided to support the WWF (World Wildlife Fund) to save the baltic Sea and committed ourselves to modernise our bus fleet, and Berlin has therefore only Euro 6 buses.